Crystalline carbon - a diamond. Creative Commons Attribution image by Steve Jurvetson from Wikimedia Commons. Take six protons, six neutrons, and six electrons and assemble them into an atom. You have produced an atom of carbon, one of the most common elements in the universe, and exceedingly easy to find on the surface of the Earth. 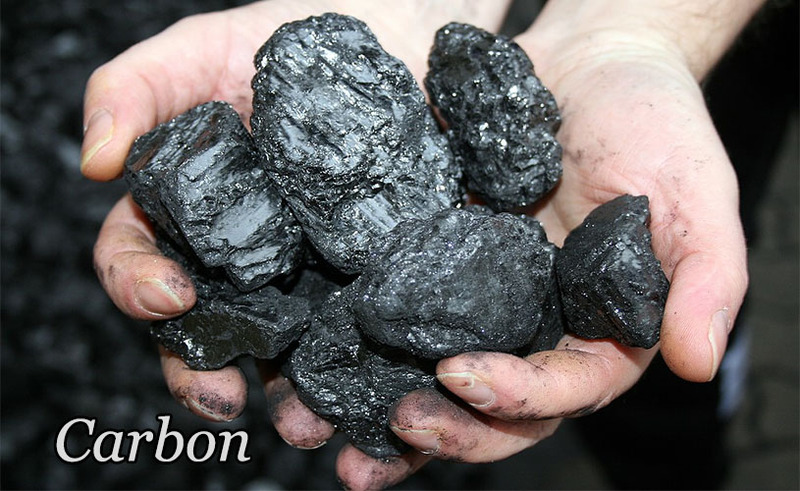 Carbon is an extraordinary element, underlying much of our existence. That extraordinary nature is built on carbon's quantum mechanical properties. To be electrically neutral, it needs six electrons to balance the six protons in its nucleus. Two electrons slot neatly into what is called the first electron shell. These have the lowest energy states, and two of them can fit into this state because they can assume opposite spin directions. The number of electrons that can be at any given electrical potential energy level around an atom is governed by the various combinations of possible configurations of their angular momentum. Angular momentum, like energy, is quantised, meaning it can only exist at certain discrete values. This is important for the structure of atoms because electrons exhibit a sort of quantum mechanical repulsion which means that they cannot exist in the same quantum state. If electrically bound to the same atom, electrons must all have different angular momenta. This law of nature is named the Pauli Exclusion Principle, after physicist Wolfgang Pauli. The angular momentum of an electron is made of two components: its orbital angular momentum, and its spin angular momentum. These are analogous to the angular momentum of the Earth being comprised of it orbiting about the sun, and spinning on its axis, respectively. At the lowest energy level available around an atomic nucleus, there is just one value of possible orbital angular momentum, so one electron can go there. But electrons can spin in two different directions, either the same direction they orbit, or the opposite direction. So a second electron can fit into the lowest energy level, spinning the other way. Electron orbital shapes. Two electrons (of opposite spin) can go in each orbital. The leftmost orbital is the first shell, the other four form the second shell. Public domain image from Wikimedia Commons. Any further electrons need to go into higher energy levels. The next available energy quantum level can be achieved by four different orbital arrangements, or shapes if you like. Unlike planets, which orbit in ellipses that are generally very close to circular, electrons don't exactly move around the atomic nucleus in neat circles. Rather, each electron sort of smears out into a fuzzy cloud. This is just the way particles behave at these very small sizes where quantum forces dominate over larger scale forces like electromagnetism and gravity. A electron isn't really like a tiny ball, it's more like a tiny cloud of fog. The electron fog stretches into different shapes, determined by the quantum interactions with the nucleus and the other electrons. The fog cloud of the two electrons in the first energy shell are spherical, centred on the nucleus. Two electrons in the next energy shell also form foggy spheres, but slightly larger. Here's where things get more interesting. There are other shapes the electron fogs can take and still be in the second energy shell. The remaining electrons in the next shell take on stretched shapes kind of like dumbbells. These dumbbells can align in three possible directions, corresponding to the three perpendicular dimensions of space: up and down, left and right, and forwards and backwards. And in each of those alignments there can be an electron spinning in one direction and one spinning in the opposite direction. This, together with two electrons in the spherical orbital, gives a total of eight different ways an electron can be in the second energy shell. Another form of carbon - graphite. Public domain image from Wikimedia Commons. But after two electrons go into the first shell, a carbon atom only has four electrons left. So the second shell is exactly half filled. This is what gives carbon its amazing properties. With an electron shell half filled, a carbon atom doesn't really like having an electron removed to leave a positively charged ion, nor does it readily accept an extra electron to make a negatively charged ion, because neither change makes much difference to the fact that the shell is seriously incomplete. In other words, the energy required to ionise carbon is relatively high. So carbon doesn't like making ionic chemical bonds with other atoms. What carbon does instead is to prefer covalent bonds, in which electrons are shared between two atoms. In this form of chemical bonding, carbon has four electrons it is quite willing to share, which is a lot, and also slots for accepting sharing arrangements for another four electrons. The fact that these numbers are equal means that a carbon atom can enter into four sharing arrangements, each arrangement involving a time-share in a pair of electrons, one from the carbon atom, and one from the other atom. So a single carbon atom can form four strong covalent bonds. This gives carbon the ability to link together into a strong crystalline structure, in which each atom is bonded to four of its neighbours, in a repeating three dimensional pattern. 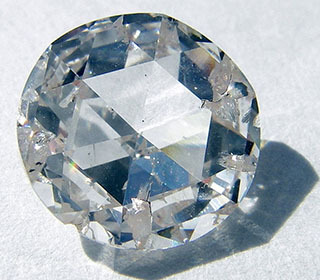 This form of carbon is exceptionally tough, and we call it diamond. Carbon atoms can also bond with just three other carbon atoms, forming very tough sheets with a hexagonal or honeycomb structure, just a single atom thick. Such sheets are called graphene, and this material is finding many unique uses in modern technology. If multiple graphene sheets are layered on top of one another, the remaining electrons can bond them together loosely, forming the soft, slippery solid familiar to us as graphite. 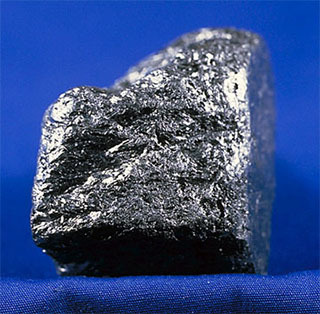 Diamond and graphite, two substances about as different from one another in physical properties as could be imagined, are both pure forms of carbon, differing only in the way the atoms are bonded together. 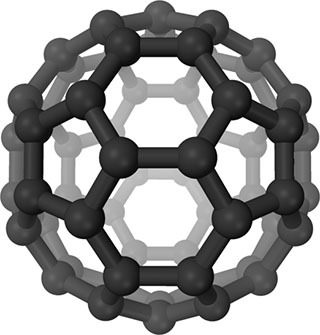 Structure of buckminsterfullerene. Public domain image from Wikimedia Commons. Carbon doesn't only bond with carbon though. The common atoms of hydrogen, oxygen, and nitrogen also form covalent bonds. In their cases, they like to form one, two, or three covalent bonds respectively. It's as if each of these atoms has a plug and socket for each desired bond. A carbon atom has four plugs, and hydrogen atoms one each, so four of them can plug into a single carbon atom. The result is the molecule CH4, which we call methane. Or two carbon atoms can plug into each other, leaving three plugs on each atom which can be filled by hydrogen. The result is a molecule with two carbons and six hydrogens, C2H6, known as ethane. We can get more complicated with our atomic construction set. Take ethane and remove one of the hydrogen atoms. There's now a left over plug on one of the carbon atoms. Plug in an atom of oxygen. Oxygen has two plugs, so attach a hydrogen atom to the oxygen. The resulting molecule contains two carbons, six hydrogens, and an oxygen. Chemists call it ethanol, but most people know it as alcohol. We can go on in this way, building fancier and bigger molecules of many types, supported by the scaffolding provided by a structure of carbon atoms and their four plugs per atom. Carbon atoms can be strung together in long chains, with each one having two plugs left over to attach other atoms. They can form rings and loops and knots. They can even form balls, with patterns of bonds identical to the seams on a soccer ball. Carbon is so prolific in its ability to form molecules that an entire branch of chemistry is dedicated to it. It's called organic chemistry. The name comes about because of the history of the field. Up until the 19th century, chemicals were called "organic" if they were produced by living things, i.e. organisms. Scientists of the time assumed that there was some vital force which gave things life, which could not be created or synthesised, so they felt a need to draw a strong distinction between living matter and unliving matter. It so happens that living things make extensive use of carbon chemistry precisely because carbon is so prolific in its ability to form complicated compounds. So "organic" compounds were generally chemicals containing carbon. Throughout the 19th century, chemists realised, to their astonishment, that they could produce some of these "organic" compounds completely artificially, producing exactly the same compounds as produced by living beings. So there was no chemical distinction between living matter and unliving matter whatsoever. The word "organic" then had no basis in any fundamental difference between living and unliving matter. So its meaning changed to refer to the major distinction left remaining: the presence of carbon. 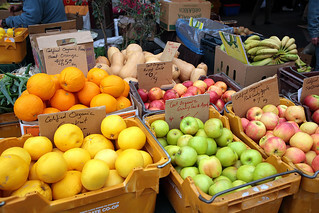 Organically grown fruit and vegetables in a market. There are a few quirks left over from this historical classification. Many rocks contain carbon, in the form of carbonates and carbides of metals such as calcium, magnesium, iron, and so on. There is also carbon in simple molecules like carbon dioxide, cyanide, and so on. These compounds are generally considered inorganic. Most of these compounds do not contain any hydrogen atoms, so you can draw the line between organic and inorganic chemistry a little more clearly if you specify that organic molecules contain covalent carbon-hydrogen bonds. Piece of the Murchison meteorite. Creative Commons Attribution-Share Alike image by Wikimedia user Basilicofresco from Wikimedia Commons. Anyway, organic compounds include all of the important classes of molecules that we need to function as living beings: proteins, fats, hormones, vitamins, sugars, starches, and so on. The very machinery of our bodies is built of organic compounds. DNA is an organic molecule, made of clumps of carbon atoms forming sugars, connected with phosphorus and oxygen atoms. The sugars connect to nucleic acid molecules, each sugar bonded to one of the four acids known as guanine, adenine, thymine, and cytosine. The arrangement of these organic nucleic acids encodes the data used to build amino acids, enzymes, proteins and ultimately all of the cells of your body. But some other organic molecules are distinctly dangerous and inimical to life. Methanol and ethanol, the two simplest alcohols, kill cells in high enough concentrations. Formaldehyde and benzene are organic molecules known to produce cancer in people exposed to them. And molecules such as tetrodotoxin (produced by various fish, including puffer fish) and batrachotoxin (produced by frogs) are among the most lethal toxic substances known. Even though organic compounds were first named because they originated in living things, we have since discovered that many organic compounds can be created by non-living process, both in the laboratory, and also in nature. Methane is a common compound in our solar system, forming much of the atmospheres of Uranus and Neptune, and Saturn's moon Titan. But much more complicated organic molecules exist in space. The Murchison meteorite fell near the town of Murchison in Victoria, Australia, on 28 September, 1969. Locals scoured the area and collected hundreds of fragments of the meteorite, amounting to a total mass of over 100 kilograms. It has since become one of the most analysed meteorite in history, because it is of the rare carbonaceous chondrite class of meteorite, which is rich in carbon, making it much more complex than the more common iron and stony meteorites. 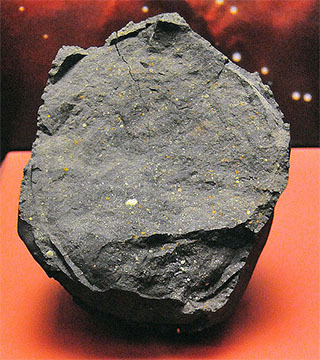 The Murchison meteorite has been found to contain a wide range of organic molecules, including many types of amino acids. These include many of the 20 amino acids used by Earthly biology, plus many of the other possible amino acids, which life on Earth does not use. It is also possible to detect organic molecules in interstellar space. The molecules produce distinct spectral signals in radio frequencies, which can be detected by radio telescopes. Using this method, we have found molecules ranging from methanol and ethanol through to a tentative detection of the amino acid glycine. These exist in large structures called molecular clouds, which are where stars form. Glycine has been confirmed in space by another method - the NASA probe Stardust detected it in the comet Wild 2. So organic compounds, far from the 18th century view of being exclusively produced by living organisms, are widespread throughout the universe. It is often said that these are the "building blocks of life". What they show is that complex organic molecules can be produced by natural processes and conditions present in various places throughout stellar systems. We don't know if there is any life beyond Earth, but the chemical ingredients are all there and ready to go. Title image is Creative Commons Attribution-Share Alike by Wikimedia user Powerhauer, from Wikimedia Commons. Last Modified: Sunday, 21 April 2013; 05:29:22 PST.